"Praying Mantises Address Labels" product is already in your cart. Like a small alien from another planet these darling Praying Mantis Address Labels create quite an impressive set of images. Set against a variety of backgrounds that include a bright pink flower, a green leaf, a white flower and another green leaf or grass, this insect is sometimes hard to see with its slim green body but its large bulging eyes and triangular head gives him a dramatic look that reminds you of a creature from space that has come to invade us. 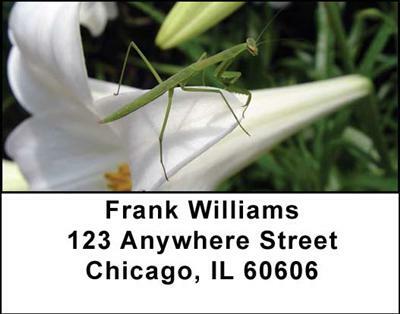 These Praying Mantis Address Labels will certainly give everyone something to talk about when they see him.